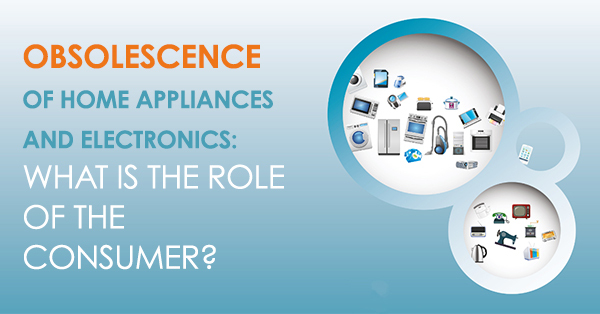 Montreal, May 24, 2018 - Équiterre today unveiled the findings of the first Canada-wide study on obsolescence and the tendency of Canadian consumers to replace their household appliances and electronics (HAEs) prematurely. The study was conducted jointly with several partners specializing in responsible consumption, social accountability and the sharing economy, including RECYC-QUÉBEC, France's Halte à l'obsolescence programmée (HOP), Option consommateurs and the Consumers Council of Canada. The Observatoire de la consommation responsable (OCR) was commissioned to conduct the research on which this study is based. The study reveals a growing trend among consumers to replace products, which are often durable goods, before the end of their useful lives. This is not because the products are no longer functional, but simply because the consumer prefers to acquire a new product for technical, aesthetic or psychological reasons. "This study of Canadians' consumption habits highlights solutions for putting an end to the throw-away culture that has seeped into our lives and become the norm," explained Colleen Thorpe, Director of Educational Programs at Équiterre. A special event to mark the study's release was held today at the Centre for Sustainable Development (CSD). The event featured a panel of experts and a "repairathon" offered by Insertech, where participants could have their electronic devices fixed for free. Alarmed by the phenomenon of overconsumption, Équiterre made a commitment in its 2017-2020 strategic plan to tackle the issue of obsolescence of consumer goods. Excessive consumption has significant impacts on the environment, human health and our economy. This report represents the first step in a reflection that will lay the groundwork for a campaign to fight obsolescence. In addition to providing an up-to-the-minute portrait of Canadians' understanding of the phenomenon of obsolescence and of the causes for the premature replacement of HAEs, it recommends concrete solutions for extending their lifespan for citizens, companies and government. In 2016, HAEs generated 44.7 million tonnes of waste worldwide, and this volume is forecast to grow by 17% by the year 2021. ● identified several potential solutions. ● Marketing strategies designed by companies, such as promotions, loyalty programs and changes to plan features, can have a significant influence on obsolescence. In order to avoid polarizing debates and to emphasize the issue of shared responsibility for the phenomenon, Équiterre has chosen to focus the debate on the simple notion of obsolescence rather than on planned obsolescence. The study reveals that HAEs generated 44.7 million tonnes of waste worldwide in 2016, a volume that is forecast to grow by 17% by the year 2021. "These figures point to the urgent need for effective collective action to minimize the amount of waste we produce. This requires major public awareness and information campaigns. We intend to continue to pursue our efforts in this regard while promoting the benefits of reuse to consumers and of the circular economy to our industries," said Sonia Gagné, president and CEO of RECYC-QUÉBEC. Équiterre received funding from Innovation, Science and Economic Development Canada's Contribution Program for Non-profit Consumer and Voluntary Organizations. The views expressed in this report are not necessarily those of Innovation, Science and Economic Development Canada or of the Government of Canada. Thank you also to RECYC-QUÉBEC.